At a little before 3:00 a.m. on Monday, two people used a Chevy pickup to try and tear down the door of a convenience store. 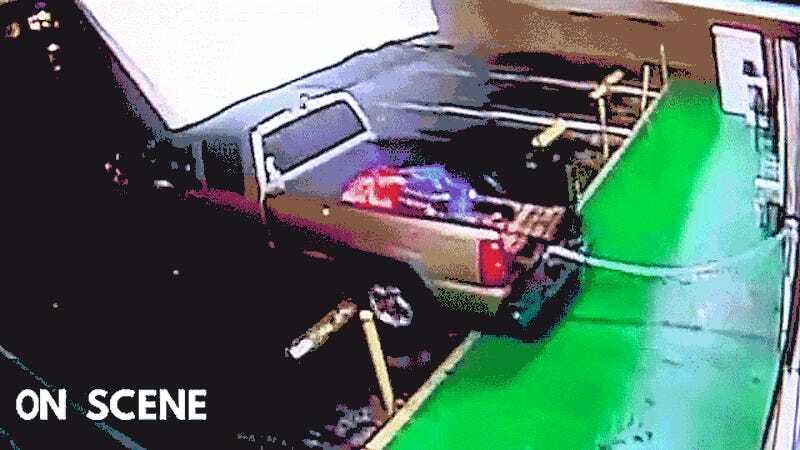 When that didn’t work, the truck became a battering ram. The burglars managed to get the store’s ATM machine into the truck bed as they escaped. Nobody was inside the store on Chestnut and Gettysburg avenues in Fresno, California according to NBC and both suspects in this video are still at large. Commandeering the ATM took inside of four minutes, even with the botched forcible entry attempt. The Fresno Police are looking for leads, and the local Fox station says you should drop them a line at (559) 621-7000 if you’ve got one. From what I can see, the truck looks like a silver extended cab Chevy Silverado from that 2003 to 2006 body style with the angry-eye headlights. What do you think? The whole heist looks remarkably similar to the Texas gun shop burglary we saw about a week ago; where a truck was also used as a door-opener. It remains to be seen exactly how much money these guys made off with, but one would imagine that ATMs are fitted with some kind of tracking device for events like this.